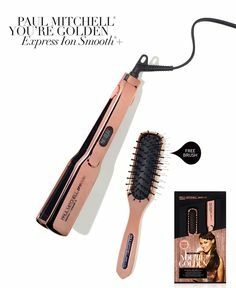 The Paul Mitchell Limited Edition Rose Gold Express Ion Smooth+ Kit includes hairstyling tools, a flat iron and a brush, that I've been using almost daily because I am able to do different styles without damaging my hair. I've used this flat iron, along with my two oldest daughters, and we all like how it straightens hair quickly and proficiently. The different heat settings, going up to a temperature of 410 F, ensures the correct amount of heat needed to style your hair. I normally keep the heat at around 360 F due to my normal textured hair. If I want to just do a touch up, I'll set it at a lower heat temperature. Premium heaters provide even heating across the plates and super-charged negative ions neutralize the electric charge in hair to help control static electricity and flyaways. The cord is long enough that I'm able to straighten my daughters' hair when they ask for help, giving me room to stand behind and reach their hair. When the flat iron is first turned on, the LCD will show the default temperature setting. The +/- button allows you to select a higher or lower temperature. The flat iron heats up in sixty seconds, with a 6-second heat recovery time. There is a one-hour auto shut-off feature just in case you forget to turn it off. This particular hair straightener is a little on the pricey side, but I've used much cheaper ones with disappointing results. I've found that some things are more expensive for a reason, and this flat iron enables me to have the hairstyles I want. The end result is satisfactory. Included with the flat iron is a vent brush. It's doesn't pull at hair and it works well with brushing hair. Both the flat iron and the vent brush have a rose gold finish. One person will win a Paul Mitchell Limited Edition Rose Gold Express Ion Smooth+ Kit. Usually I'll straighten my hair a few times a week. Sometimes everyday of the week if I can. I try to straighten my hair a few times a week. I do have curly and frizzy hair at times. I don't straighten my hair...but my daughter straightens hers every day. I'd love to win this for her. I straighten my hair about 4 times a week. I have two daughters that straighten their hair every day! I only do it about once every other week. I don't have a straightener, so it's a huge pain. I would love to try this out though! I was straightening it every day until my hairdresser said I was burning my hair. I need a good product like this to try again. During the summer usually twice per week. I do so about twice a week. A few times per week, usually when I want to have that sleek hair look. Otherwise, I let it go natural. I like to straighten my hair about every other week. I like to straighten my hair about twice a week. I like to straighten it a couple of times a week. I straighten my hair 2 or 3 times a week. i do it a couple times per month. I straighten once a week. I don't straighten it as much in the summer because of the humidity...so about once a week. I have to straighten my hair every day! I do not straighten my hair but my 17 year old daughter does hers on a daily basis. I don't straighten my hair but my daughter-in-law does quite often. I straighten my hair about once a week. Sometimes it works, other times it doesn't. With summer, it's always hard to figure out what my hair will do! I straighten my hair 4-5 times a week. Probably 2-3 times per week. I have never straightened my hair. I straighten my hair almost every other day. A few times a week. I like it straight when it's longer. probably once a month since it's so bad for your hair!! I straighten my hair 3 times per week. I straighten or touch up my hair everyday. I straighten my bangs almost every day, and I do all of my hair a few times a week. I don't do it too often -- just when I want to look extra good! LOL. I have straight as an arrow hair but my daughter's hair needs it! I straighten my hair almost every time I wear it down. I do not straighten my hair but I would like to try it. I straighten my hair daily. I occasionally straighten my hair. Our daughter frequently straightens her hair. I straighten my hair everyday! I have since I was a teen! I have very curly hair and I love to try new straightening products to see which works best for me and I have never seen this before. It looks amazing! I straighten my hair about 3-4 times a week! A few times a month since I don't want my hair to get damaged and dry. I straighten it a few times a week. I straighten my hair every few days, with a blow dryer. I'd love to try this so I hope I win! My daughters straighten theirs every other day almost or after washing.